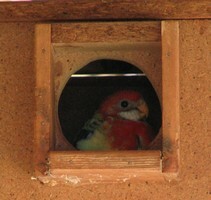 We have a nest box attached to the house. 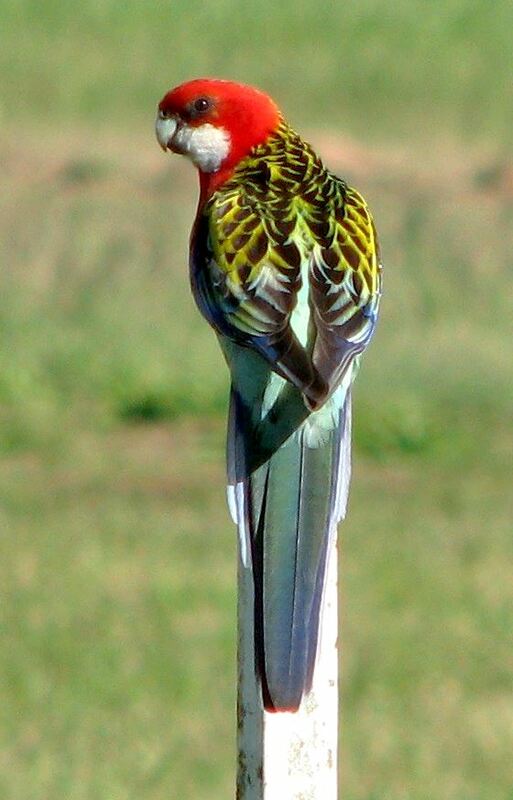 The Eastern Rosellas are wild and are free to come and go as they please. 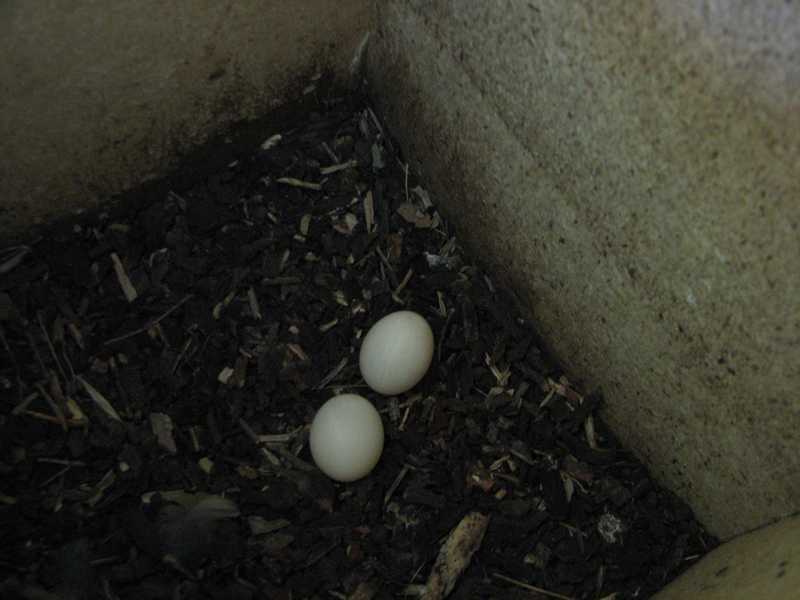 The Eastern Rosellas have started laying a second batch of eggs, starting on 18th December, second egg in the afternoon of the 19th December. 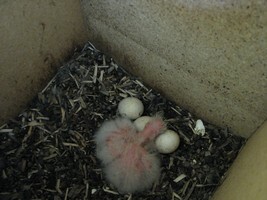 A total of 4 Eggs laid, first one hatched on 8th January 2012 in the morning. 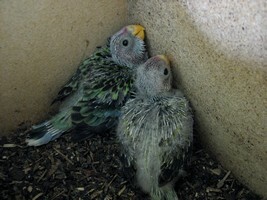 DAY 7 - Cute little fluff balls, their heads just flop around over the top of each other. 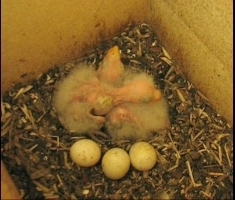 DAY 8 - First chick is 8 days old, second chick is 7 days old. Getting bigger, and louder. 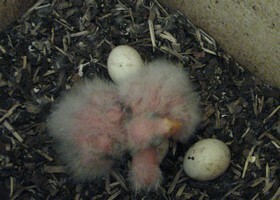 DAY 9 PHOTO - TAIL FEATHERS STARTING DAY 9 - First chick is 9 days old, second chick is 8 days old. They look a little different from yesterday, eyes more open getting bigger, and louder. 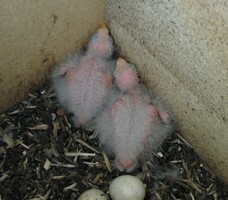 Looks like different feathers starting to form. PHOTO - DAY 11 - DAY 10 - Getting bigger and making lots more noise. Looks like their crops are full . Probably full of our oats. 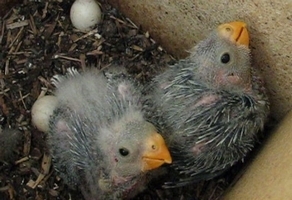 PHOTO - EASTERN ROSELLA CHICKS DAY 16 DAY 16 - I finally managed to get a video when both parent Rosellas were away from the nest box. She has been staying in the box, and he has been feeding her in there. 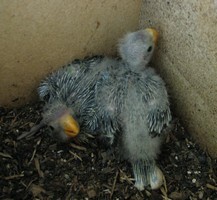 They have quite a lot of greyish feathers now. Can't wait for the colours to start showing. DAY 22 - More colour, red, blue yellow green, looking very pretty now. 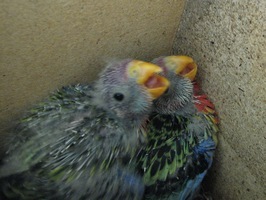 DAY 24 - Showing a lot more red on their heads now. 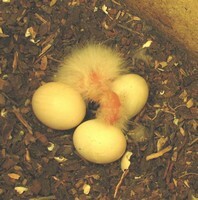 The colour difference is so great between the two chicks (hatched a day apart), it makes me think one could be a male. 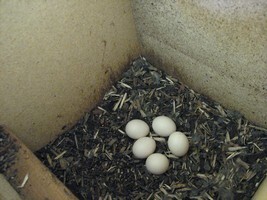 They are making a lot more noise when I lift the lid to the nest box to take the photos. When they are adults it is very hard to tell the difference between the male and female, but sometimes to me the father looks more vibrant than the mother. DAY 26 - In this video you can see how long the tail is now, and they are getting much more colour, white cheeks are showing better. 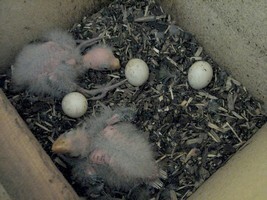 Video was taken just after both parents had given them a feed. 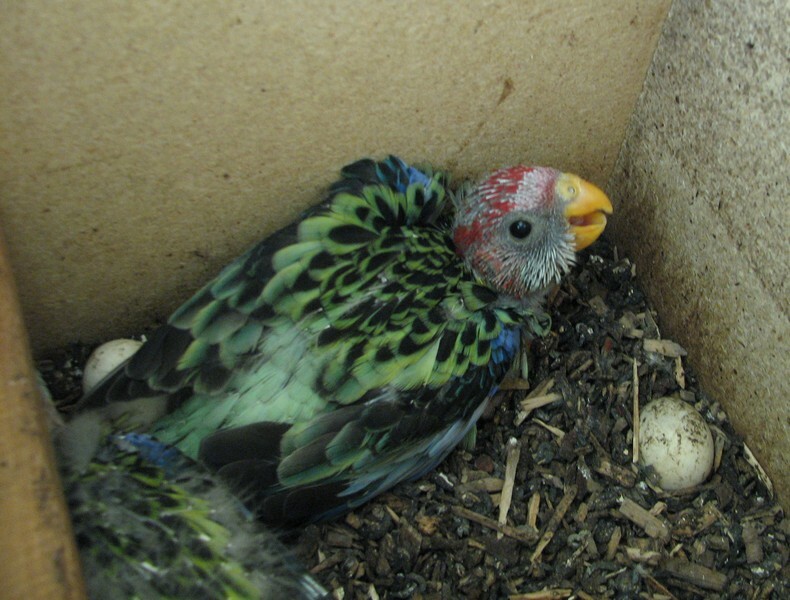 DAY 28 - No more peeking into the top of the nest box as today one of the little Eastern Rosella chicks managed to poke his head out of the nest box hole. 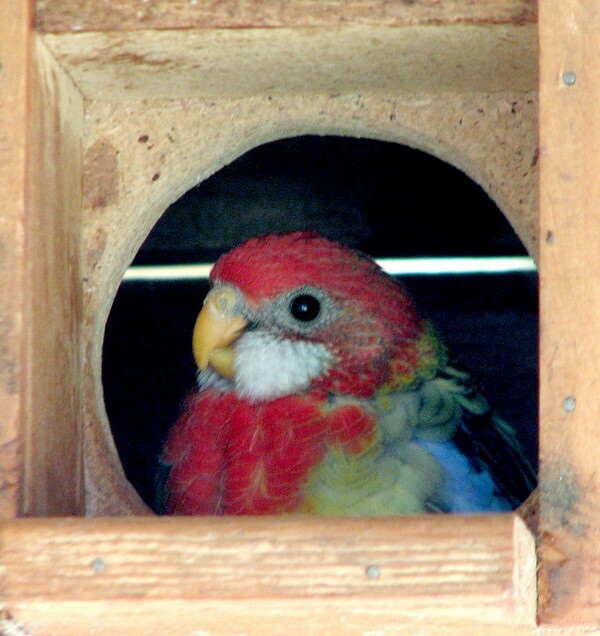 In the video, you can't see the birds, just a slight blur of wings through the hole, and the sound of beating wings. 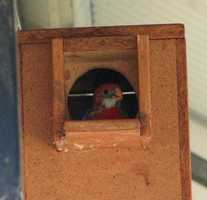 DAY 30 - In todays video you have to look carefully into the nest box entrance hole. One baby looks out, then fades away, then the other baby slowly rises to look, then the other baby rosella looks as well. Sorry the video is not clearer, but had to zoom in a fair bit, if I get closer they just drop out of sight. DAY 32 - Looking just like a minature rosella now and sitting in the doorway for a bit longer. He must be hogging the space as I don't see the second baby very often. I think this baby left the box sometime during the day. Day 33 - This is the last photo/video I have of one of the babies, I think it is the second/youngest baby as it is so shy. 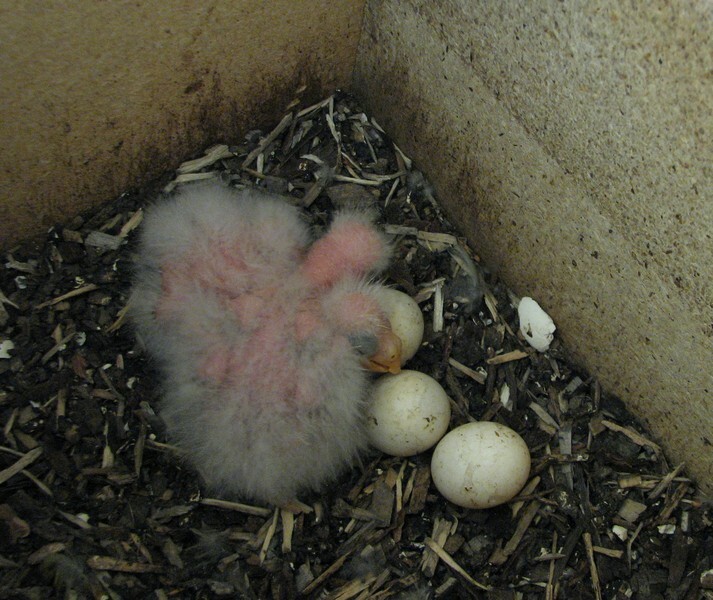 I believe it left the box sometime today, as I did not see or hear the parent birds during the afternoon at all. Unfortunately I did not see either babies leave the nest. Cleaned out the box on Sunday 4th December 2011- Both parent birds checking out the box again, so maybe will have a second laying. 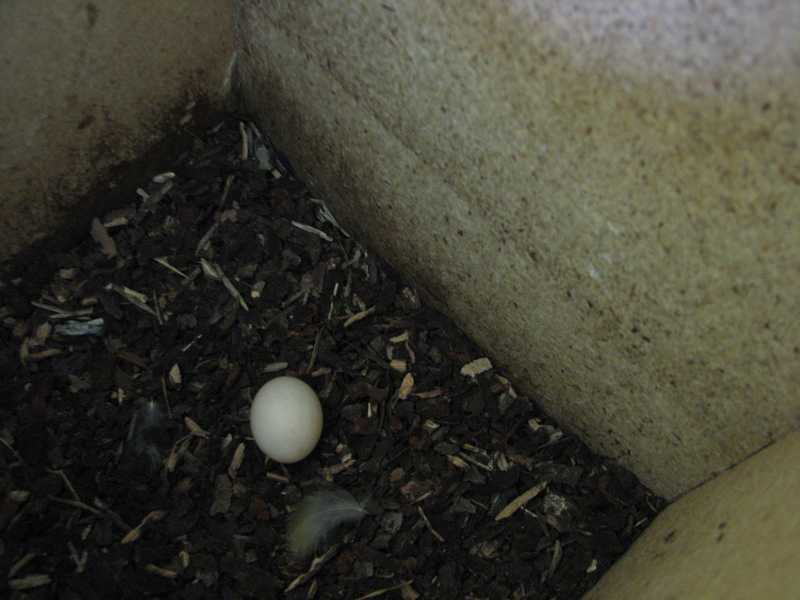 They have laid another egg. 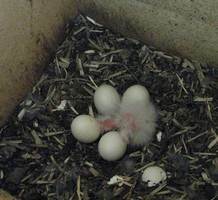 Exactly 9 weeks since they laid the first egg for the first brood. 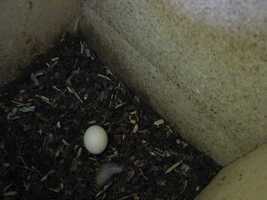 Egg number 2 laid in the afternoon. Chick hatched this morning, 8th January 2012. 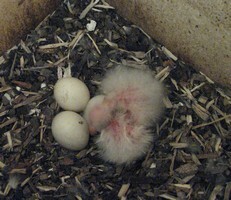 Photos and video of one day old chick.